I am sure you guys enjoyed Dinagyang Festival 2012 as much as we did! And were you able to take photos? Are they exceptional and unique? 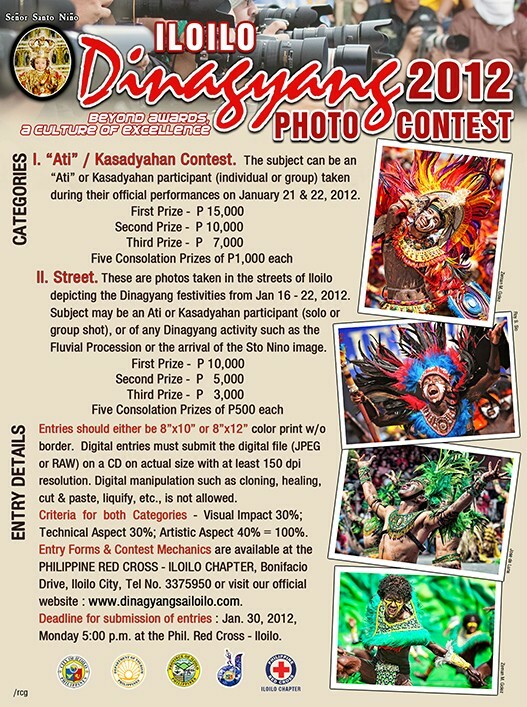 If you think they are then you should join this year’s Iloilo Dinagyang Photo Contest 2012! Below are the contest mechanics and the entry form. Good luck! PHOTO ELIGIBILITY -This contest is open to all professional & amateur photographers and hobbyists. The subject can either be an Ati or Kasadyahan participant (individual or group) taken strictly during their official performances on Jan 21 & 22, 2012. Deliberately staged or posed shots are not allowed. These are photos taken in the streets of Iloilo depicting the Dinagyang festivities from Jan 16 to 22, 2012. Subject may be an Ati or Kasadyahan participant (solo or group shot), or of any Dinagyang activity such as the Fluvial Procession or the arrival of the Sto. Nino image from Cebu, among others. Visual Impact: 30%; Technical (exposure & focus): 30%; Artistic (creativity & composition): 40%. Total: 100%. Accreditation Forms can be downloaded from www.dinagyangsailoilo.com or call City Information Office at 3371235 for details. Last day for submission of forms shall be January 10, 2012. A maximum of 6 entries shall be allowed per photographer in this category. · Each entry must be taken with a digital or film camera and submitted in either an 8″x10″ or 8″x12″ color print without border. Digital entries must also submit the digital file (either on JPEG or Raw) on a CD on actual size with 150 dpi resolution or higher. Corresponding negatives should accompany film entries. All photographs should accurately reflect the subject matter and the scene as it appeared. Photos that have been digitally altered or manipulated beyond standard optimization may be disqualified. Images that do not meet these requirements may or may not be judged at the judging panel’s sole discretion. Participants should write on a piece of paper their name, address & contact number taped on the back of all their photo entries. These, plus the CD, should be sealed in a long size brown envelope for submission. Deadline for submission of entries will be on January 30, 2012, 5:00 p.m. at PHILIPPINE RED CROSS – ILOILO CHAPTER, 2nd flr. Bonifacio St., beside Ramon Q. Avanceña Hall of Justice), Iloilo City. Tel. No (033) 337-5950. By submitting an entry, each participant agrees to the Official Rules and warrants that his or her entry complies with all requirements set out in the Official Rules. By entering the contest, participants grant the Iloilo Dinagyang Foundation Inc (IDFI) a royalty-free, world-wide, perpetual, non-exclusive license to display, distribute, reproduce, and create derivative works of the entries, in whole or in part, in any media, for any educational, promotional, exhibition, archival, and all other standard purposes of the Foundation. Any photograph reproduced will include a photographer credit as feasible. The Iloilo Dinagyang Foundation, Inc will not be required to pay any additional consideration or seek any additional approval in connection with such uses. All prints & CDs submitted shall be the property of the IDFI. Pre-screened entries will be exhibited on February 6, 2012 at SM City Iloilo (tentative schedule). The awarding of winners will also be held on the same day. NOT ALL ENTRIES SHALL BE ON EXHIBIT. The decision of the Board of Judges is Final. The organizer shall have the right not to entertain any protest or complaint after the final decision of winners shall be made. I just have to say this – I can’t wait for Dinagyang 2013!